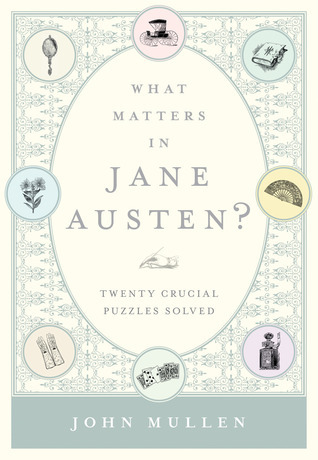 Title: What Matters in Jane Austen? This book was a very enjoyable read and answered a few questions I'd wondered about myself and a few I'd never thought to ask. It is both informative and entertaining and will be a delightful addition to the collection of any Austen fan. This book is really only suitable for those who know the books well as such knowledge is necessary to full understand the points being made, but it will be great fun for those 'in the know'. This is an easy read and can be approached from cover to cover or dipped into a chapter at a time according to one's mood.